Top EU officials toured an asylum seekers’ camp in Turkey, praising president Erdogan for his efforts in tackling the refugee inflow. That comes as human rights groups have been particularly vocal in their criticism of Turkey’s treatment of refugees. The delegation of European dignitaries, which included German Chancellor Angela Merkel, European Council President Donald Tusk and other officials, came to Turkey in the latest effort to grease the deal under which Ankara has promised to help Europe deal with the refugee crisis. 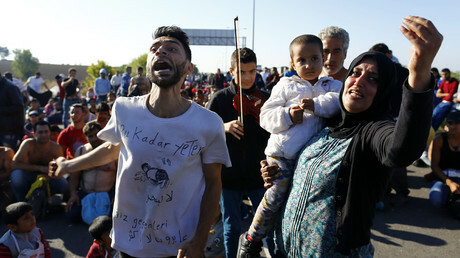 They visited the camp in Nizip, Gaziantep, close to the Syrian border, which hosts more than 4,800 refugees, the Anadolu News Agency reported. Prior to the Saturday visit Merkel said she intended to see how things on the ground were for the refugees in Turkey. The host nation was represented by Turkish Prime Minister Ahmet Davutoglu, who personally translated what the refugees were saying to Merkel, as well as his wife, Turkey’s top EU accession negotiator Volkan Bozkir and other Turkish officials. 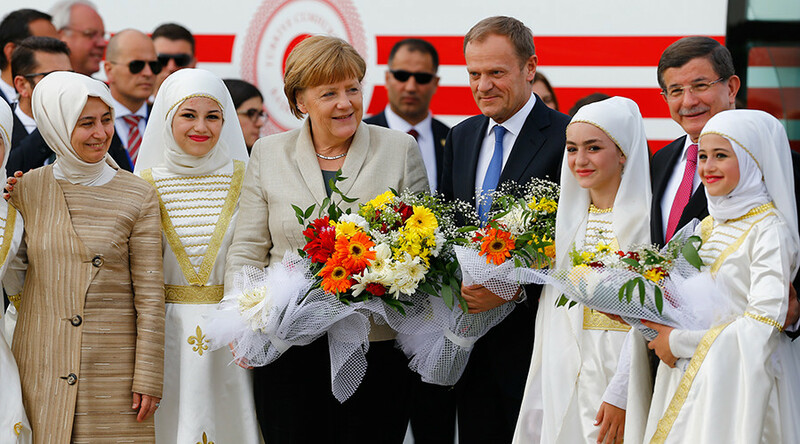 The European politicians posed with four young women in white ceremonial dress before shaking hands with five Syrian men and their children. All other refugees were hidden and journalists prevented from talking to them. As the leaders were leaving the camp, several Syrian children chanted “Syria and Turkey are together” in Arabic, Anadolu reported. One of the refugees said: "May Allah give strength to President Erdogan," referring to the Turkish president. The praises didn’t come from the refugees alone. Speaking at a media conference during the visit, Tusk said: “Turkey is the best example for the whole world (on) how we should treat refugees." “No one has the right to lecture Turkey what to do,” Tusk added. The EU pledged to provide 6 billion euros to Turkey in exchange for its help in stemming down the flow of asylum seekers into Europe from the Middle East. Ankara also wants the talks of its EU accession unfrozen and EU travel restrictions for Turkish citizens reduced by summer. The latter appears to be the biggest stumbling block, as the Europeans want to impose certain legislative conditions on Turkey for such liberalization to happen. Ankara is adamant in its position. The visit comes as EU officials are facing an increasing public outcry at home over what people perceive as bending to demands from a government that doesn’t share European values. Merkel saw an 11 percent point drop in approval rating after approving criminal prosecution of a comedian, who read a crude poem critical of Erdogan on German national television. 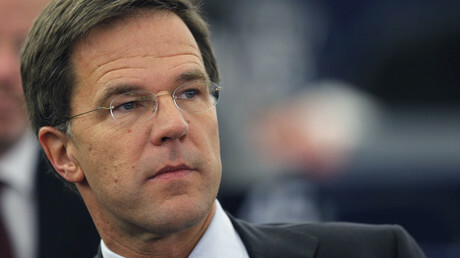 In the Netherlands a scandal flared after the Turkish consulate in Rotterdam urged Turkish citizens to report “messages from people who are insulting our president, the Turkish nation or Turkey in general.” Dutch Ambassador in Turkey Cornelis van Rij had an opportunity to discuss the situation on Friday, while providing explanations about cartoons depicting Erdogan published in the Netherlands, according to the Hurriyet Daily News. Turkey’s record in tackling refugees is far from clean. This month Amnesty International reported that the country sends Syrians back to its war-torn country in their hundreds daily. Earlier rights groups reported that Turkish border guards were subjecting people fleeing from Syria to summary executions. Ankara’s response to the allegation is denial. The conditions for many refugees are worse than what the European dignitaries had been shown in Nizip. According to the Syria Relief Network, a coalition of NGOs, only a third of child refugees from Syria are going to school in Turkey. Many of those children have to work instead. “Their families may earn only $100 a month, so [the parents] send the children to work,” Abu Shihab, Syrian manager of a sweatshop in Gaziantep that employs Syrian children, told the Guardian.